Complete chimney rebuilding in MA. We can restore any chimney in poor condition. If your chimney is badly damaged or its condition has deteriorated over the years, chimney repairs may no longer be an option. 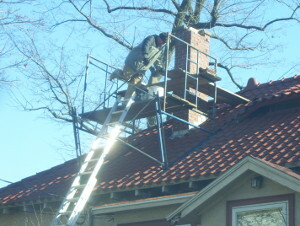 GF Sprague offers expert chimney rebuilding throughout Newton, Needham, and areas nearby in MA. We can completely rebuild your chimney so that it looks and functions as good as new. Contact us today to schedule a free cost estimate for any of our chimney repair or rebuilding services in Greater Boston! Trust our masonry experts to rebuild a beautiful chimney for your home. If only a few bricks on your chimney are cracked or spalling (breaking off in fragments), they can typically be replaced. If your chimney has become too damaged, we will likely need to partially or completely tear down and rebuild the structure. Chimney rebuilding can become necessary due to a number of factors such as water infiltration, the wear and tear of age, crumbling mortar, severe weather, and lack of chimney maintenance. Before rebuilding your chimney, the specialists at GF Sprague will complete a thorough chimney inspection to determine the best approach and then take care of any necessary demolitions to the chimney crown and masonry brick with care and attention to detail. With any chimney rebuild, we try to use any existing bricks that are still in good condition. Any new bricks and mortar that we use will be carefully matched to the existing color and style so that your new chimney perfectly fits the aesthetic of your home's exterior. When you hire us to restore or rebuild your chimney, you can be sure that all work will be completed in accordance with state and local building codes. Call or contact us online to find out more or to schedule your free quote in Newton, Needham, Wellesley, or nearby.